With olive green being the new neutral, it makes the army green utility jacket even more of a closet staple for its year-round versatility. It's a color that lends itself to easy styling whether dressing up or down. Personally, I tend to feel cold even in the summer, so I find myself always looking for a jacket to wear on my way out the door. This parka would be a great alternative to the blazers, leather and jean jackets that I tend to wear. 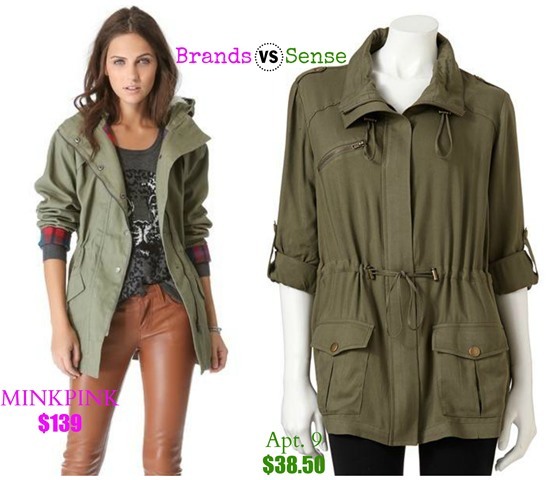 As inexpensive as the Minkpink utility jacket is, I'm sure a frugal shopper will find the price tag of the Apt.9 (also available in petite) version much more appealing. I love how the drawstring cinches the waist keeping it from looking like you're wearing a potato sack.